First, let’s look at how much that weight difference really amounts to. For a rider who weighs 165 pounds and a bike that weighs 15 pounds, adding 10 pounds increases the weight of rider-and-bike by 5%. 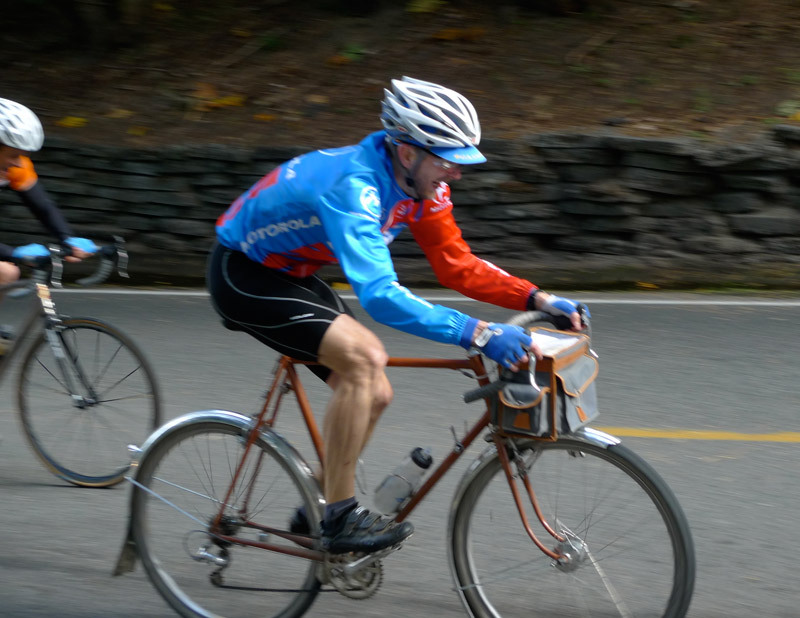 To keep up with the titanium racing bike, the rider on the randonneur bike has to put out about 4% more power. Is that feasible? A few years ago, we did a double-blind test. Jeff Lyon built four frames for us. They were identical, except for minor variations in frame tubing (and hence frame stiffness). The differences were small – just 0.2 mm difference in the wall thicknesses of top and down tubes (Bike 2), or 1/8″ in the diameter (Bike 3). Bike 4 was a duplicate of Bike 1, as an additional check of our results. Apart from those two frame tubes, all four bikes were absolutely identical – same tubes, same geometry, same paint, same components. Even the same weight: The lighter frames had weights inside to equalize the weight. The goal of this experiment was simple: We wanted to see whether small differences in frame tubing are discernible to the riders, and whether they make a measurable difference in performance. Would our riders prefer the stiffest bike? Or the most flexible? Or would it make no difference at all? The test was a true double-blind test. Neither test riders nor test administrator knew which frame was made from which tubing. To hide the tubing diameter (one frame used oversized tubing), the bikes were wrapped in foam insulation. In every way, the test met the most rigorous scientific standards. We rode the bikes in a variety of tests. One of them was an uphill sprint for 340 m (1100 ft), with two testers racing each other. Both bikes were equipped with calibrated power meters. We repeated the sprints five times, with the riders switching bikes after each run. After the fifth run, the riders were exhausted, so we stopped the experiment. It’s one of half a dozen experiments that all showed the same: Small differences in frame tubing can lead to a significantly different feel and performance. The difference in power output was about 12%. That is huge, and it shows that the frame’s tubing, and how it interacts with the rider’s pedal strokes, affects how fast a bike climbs – more than almost anything else (except the rider’s fitness). To give this phenomenon a name, we called it “planing” – like a boat that rises out of the water and requires less energy to go at higher speed than it did fully submerged at lower speeds. Back to the comparison between the randonneur bike and the titanium racing bike: Yes, it does weigh 10 pounds more, but we now know that a difference in power output of about 4% is well within the range of possibilities. And that extra power can compensate the heavier weight of the randonneur bike, making both bikes climb at the same speed. Information about Bicycle Quarterly, the magazine that did this research. The full story of the double-blind experiment: Bicycle Quarterly 24. More double-blind tests, including power data, and a physiological explanation how “planing” works: Bicycle Quarterly 28. Titanium shoot-out: Bicycle Quarterly 42. Thank you to all who made the original research possible: Jeff Lyon built the test frames; Hahn Rossman assembled them and administered the test; Mark Vande Kamp and Alex Wetmore volunteered as testers. 110 Responses to What is Planing? I still don’t get how these ” flex characteristics” translate to more power. It would seem that flex would absorb effort and make one more inefficient. A bike frame, especially one made from metal, is a very efficient spring. That means it returns almost all the energy you put in. I believe in planing. I think of a bicycle frame as like a ski. When you flex the ski and carve a turn, the ski rebounds and that energy jets you forward into the next turn. A more aggressive or heavier skier will probably prefer a stiffer ski, but there is no doubt that the ski flexes and returns that energy on the rebound. A bicycle frame similarly flexes and returns some of that energy in the dead spot of the pedal stroke- “planing”. As a fan of more flexible frames, I certainly think the phenomenon you describe exists. Do you have any ideas on the mechanism of “planing”? What is it about frame flex that allows more efficient conversion of ATP into work? Fun stuff. Speaking of power strokes, do you think BQ will ever do a study of non-circular chainrings? Perhaps… There are many people who swear by them. I am definitely a believer of the phenomenon you describe. My main bike has a super-light and flexy top tube — 7/4/7 and 58cm long. The downtube is 8/5/8. I love the way it rides — sometimes, when I am really jiving, I feel like I am floating up hills. I need only hop on a different, stiffer bike to feel bogged down. My Long Haul Trucker is a nightmare in comparison. The downside is that the bike feels squirrely in hard corners. Really squirrely. The whole frame flexes in weird ways. I should note that I am probably heavier than really ideal for the frame. I bet an 8/5/8 toptube would offer similar performance and better feel while cornering. It’s also a low-trail frame which I have noted can feel strange if my front bag is loaded at the right weight and I corner hard enough. We are doing some testing of various frame tubing configurations to see whether they handle differently in corners. You really need the same front-end geometry to be able to compare. The Long-Haul Trucker will descend and corner very differently, not just because the tubing is different. 1. The graph does not seem to be consistent with the 15% increase in power for Bike 2. Bike 2 power is approx 620W, while Bike 1 is 570W (1st runs each). A 50W difference or 9%. Still impressive increase but not quite 15%. 2. Is Bike 2 the bike with more flexible tubing??? Did not quite see it spelled out. 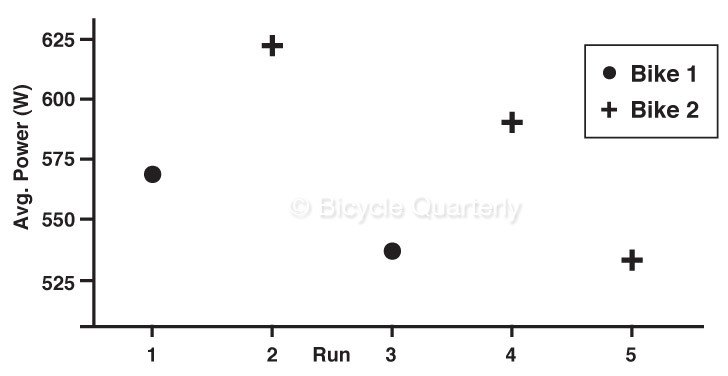 When you compare Run 1 with Run 2 directly, you don’t account for the rider’s fatigue. If you take the vertical distance of the lines that go through the datapoints for each bike, you get 12-15% difference. OK, I see what mean about extrapolating Bike back to run #1 on bike #1. What about 2nd question? Did Bike #2 have the more flexible tubing??? Yes, when we unblinded the test, we found out that Bike 2 had the more flexible tubing. May I follow up on John’s #2 query please? But if the rider on the heavier bike is putting out more power, and they arrive at the top of the hill at the same time, then the rider on the heavier bike did more work. In other words he had to expend more effort to keep up. Work and effort are not the same thing. If you do a “plank” (a push-up without pushing up), you aren’t moving, so you aren’t doing any work. Yet you’ll expend quite some effort, and you’ll fatigue quickly. How sensitive are the optimal flex characteristics to power? You appear to have tested at peak anaerobic power. What about sustainable endurance power? Those are good questions. When you look at the entire test data, you see that a second tester, who put out more power, did equally well on both bikes. For him, the stiffer Bike 1 worked as well as the more flexible Bike 2, at least for an all-out effort. This indicates that the lower the power output, the more flexible the bike should be. Consider, however, that even at 500-600 Watts, the most flexible frame you can build today worked best for the tester shown in the graph. Few of us can put out that much power over any length of time! You often mention “standard” and “oversize” tubing, but you do not specify diameters. So what does “standard” and “oversize” mean exactly? For example, is a top tube with 28.6 mm diameter and a down tube with 31.7 mm already oversize, or is it still standard? Standard is 28.6 mm down tube, 25.4 mm top tube (or 28 and 25 mm in the metric sizes of old French bikes). 31.7 mm down and 28.6 mm top tubes are oversize. Then there is double-oversize… All this assumes steel tubes – with other materials, there aren’t really any standards. So, for standard-diameter (non-OS) tubing, what is currently your ‘preferred’ wall thickness for top and down tubes? Does it vary with rider size / frame size? I think tubing choice is very individual, but I think in today’s world of oversize and overbuilt frames, it’s best to err on the light side. My Herse is built from 0.7-0.4-0.7 mm top and down tubes. I love the way it rides. We are experimenting with some other tubing wall thicknesses and configurations to see whether we can improve on that. I’ve always thought of planing as a match between the rider’s power, weight, the cargo, the road, and the bike, including bars, stem, wheels, tires, and frame. I wonder if a light, fast rider will always benefit more from planing than a heavy, slow rider, even when climbing? Power is key. How about bikes meant for carrying a camping or utility load? What is the effect of rider and cargo weight on planing? How does the match change? I love this topic as much as helmets, tires, and chain lube! It’ll be a long time until we put all this into formulas. In the mean time, just thinking about optimized flex characteristics (rather than the now-obsolete “stiffer is better” or “stiffness doesn’t matter”) can guide the design of bicycles that are a joy to ride. Do you think it would be possible to achieve more frame flex by increasing Q factor? You’d get more leverage, but at least for me, the ability to spin is at least as important as the “planing” of the frame, and when the tread (Q factor) gets too wide, my spin suffers. I was just wondering about the mixte design and planing. The most flexible top tube would be no top tube. Any experience with them? I assume your camping bike has a top tube plus the mixte stays. Maybe a mixte is nice for very low power outputs riding around the city. I’d be interested in reading about the reasons behind that design, or maybe it was just a style thing. I haven’t ridden enough mixtes to say much about their flex characteristics. The camping bike has a standard top tube plus the stays, so it’s very stiff. I rode a mixte frame briefly about eight years ago (low power output riding around the city; frame was chromoly, but a simple one, from VSF Fahrradmanufaktur, early 90s), and it was the most amazing ride, particularly when standing on the pedals: without knowing why, without knowing Jan or BQ, I felt that ‘fastness’ which he and the BQ team has since spent a great deal of time studying. Now I know that it was the beneficial flexing of the frame. Your analysis seems well developed. We are, indeed, getting into very gray areas with this discussion. I had a long ride today with many hills, and I frequently wondered if I’d be climbing better on a high-performance, thin-tubed bike with all the appropriate components. But there are few people who can attest to these sublet differences. You make due with the bike you have, in most cases. Jan, Mark, Hahn, and others can speak to these differences in a way that I certainly cannot. It reminds me of the series of films made by Alain Decadenet on the great Alfa Romeos, Jaguars, Ferraris, etc from the golden age of handmade race cars. He had a unique perspective. For example, he dro ve a “long-nose” and “short-nose” D-Type Jags on some twisty California roads. He acknowledged that test would have been better conducted on the roads of the LeMans 24-hour race. The nature of how they were driven, and where they were driven, and how they were intended to be driven we factors impossible to quantify. I am interested in what is uncovered by the research of BQ, even though some of the discoveries will forever remain there theoretical observations for readers like me. If frames are springs, then wheels are too. Were the wheels identical in your test runs? On rim-brake bikes “too-flexy” wheels are bad because they result in brake pad rub. With disc brake road bikes rim-brake rub is no concern. I wonder – on a disc-brake bike could one tune one’s wheels to contribute to “planing”? The wheels were the same – all components were the same. Also, the test administrator switched wheelsets between test repititions, just to make sure there wasn’t some invisible difference (spoke tension?) between wheelsets. I think rather than the wheels spring, tire pressure might affect “planing”. BQ contributor Alex Wetmore suggested this long ago. Is there an objective measure of a frame’s “flex”? For example, applying a known force and measuring the deflection? We have tried, but it’s not easy to isolate what matters. The “Rinard” test clamps the frame by the bottom bracket and applies weights, which in theory allows you to measure the stiffness of the main triangle separately from the rear triangle. In practice, all it measures is the stiffness of the bottom bracket shell, so it’s of little use. The “Barra” test is more realistic. It supports the frame at the head tube and at the rear dropouts, then applies a weight to the bottom bracket shell. We found that overall frame stiffness does not correlate well with the feel and “planing” of the frame. From this, we concluded that the balance of the frame tubes is more important than the overall stiffness. It seems to me these are a static tests, where perhaps a dynamic version of the Barra test might yield more insight. Subjecting the frame to repeated pulses at a set frequency, and then varying both, might elicit a zone of forced harmonic oscillation or at least an analogue, which is how I envision planing. Something like a fatigue test but staying within the steel’s elastic zone so as to measure feedback rather than induce failure. This is not the case with the bike though, as shown by the graph the rider is outputting more power to go faster. Basic physics tells us power can not be created out of nothing, it has to come from the rider, so planing is maybe allowing riders to output more power through an increased pedal stroke – maybe this has more similarity to when a rider gets out of the saddle when climbing and rocks the bike from side to side than it does a boat in the water, although we know the reason riders don’t ride like this constantly is because it is less efficient than sitting down and so much more energy would be used by the end of a race or ride. A much more interesting experiment with the double blind study would be one where each rider was told to ride to a set power output – say 300 watts which could be measured at the crank – we may then start to see what is more efficient and maybe more relevant to a ride or race overall, rather than a short hill climb. Our tests also included longer rides. On long rides, being more biomechanically efficient is key. If you are going at 70% of your max up a hill, you will fatigue much less than if you climb the same hill at 80% of max. So the bike that “planes” better under a lower power output will be much easier to ride over long distances. A much more interesting experiment with the double blind study would be one where each rider was told to ride to a set power output. Finally, I can tell you that despite getting older, my speeds in long brevets have gone up since I switched to bikes that “plane” better for me. I wrote “energy” and not power, because you have to include the rider in the system. And if the bike is more biomechanically efficient, the rider puts out less energy to produce the same power, or he/she produces more power for the same energy. “Planing” is not a perfect analogy, but giving the phenomenon a name has allowed people to visualize it. Hmm. What you are implying, in effect, by this, is we are losing up to 15% of the energy expended when riding a bike that does not plane, to create the same power at the wheel. In which case, where do you think these energy loses are going? This would mean a pro outputting 300 watts power, would have lost more than 50 watts in the kinetic chain somewhere. We really don’t need to do this experiment though, Newton gave us the tools long ago to know, if we had two bikes with 300 watts of power at the cranks, ignoring friction losses, the one that is lighter would go up the hill faster – if there is any efficiencies made from planing, it must be before the cranks in the kinetic chain, as there is nowhere else for the energy to go but to the back wheel at this point and no more energy is created by the bike. I have no doubt that you are faster on a bike that planes – I think we get used to certain bikes and styles of riding – I ride my flexible steel bike in a totally different way to my stiff carbon one. I have faster times on the carbon though, not that I think this proves anything. What I think you are saying is that riding a bike that planes is more efficient than a bike that doesn’t, but all you have shown (that I am aware of) thus far is that when a rider produces more power he goes faster. However, as far as I know this could be shown relatively easily in the lab by measuring O2 usage and thus how much energy is used to keep the bike at a constant speed or power output – I would be very interested in such a study, which could be done at any University with a sports lab. With the caveat that it also needs to be double blind, with a group of riders that are used to riding a range of bikes. If you could show that a bike that planes needs less energy to produce the same power as one that doesn’t, well, then you may turn a few heads. When we ride our bikes, we don’t care much about how efficient the bike is in physical terms. (Unlike cars, we don’t try to minimize the calories burned per mile). We care about power (in a sprint) and fatigue (over the course of a ride). A bike that goes allows us to put out more power in a sprint, and also allows going longer and faster with less fatigue will be the one we pick. What we have shown is simply that the rider’s power output isn’t constant, but that it is affected by the flex characteristics of the frame. And that two riders put out more power on frames that are the most flexible you can build from steel today with commonly available tubing. What you are implying, in effect, by this, is we are losing up to 15% of the energy expended when riding a bike that does not plane, to create the same power at the wheel. I am sorry if it wasn’t clear. It’s not that you burn 15% fewer calories on Bike 2 than on Bike 1. It’s just that our rider’s body can put out 15% more power on Bike 2 than on Bike 1. He may burn 15% more calories while doing so. Most of us don’t really mind. On a long ride, the extra calories burned could be a disadvantage, since he’d have to carry more food, or stop more often. Still, it’s a tempting proposition to increase your power output like that, especially since it also works for longer rides. From the well-experienced custom frame builders I’ve spoken with, they feel relatively minor differences in chrome-moly tubes make less of a difference in the rider’s experience of a correct-fitting frame than frame angles, wheels and tires. My experience riding two different steel bikes of nearly identical size and materials with the same wheel and tire combination supports this. One is a vintage racing frame, the other a sport-tourer so they have notably different frame angles. Each has a ride and handling quite different from the other. For the bike’s handling, I agree – it’s all in the front-end geometry. As for ride quality and comfort, again, I agree – fork offset, the material of the fork blades and (most of all) the tires make the biggest difference here. As far as performance goes, our testing has shown that the frame tubing has the biggest impact. For Bicycle Quarterly‘s road tests, we’ve tested more than 60 bikes by now, riding each for several weeks and at least 200 miles. We never ask the builder beforehand what tubing they used, yet we can predict the frame tubing with great accuracy. Second tester Mark (whose power data is shown above) is better at this than I am. 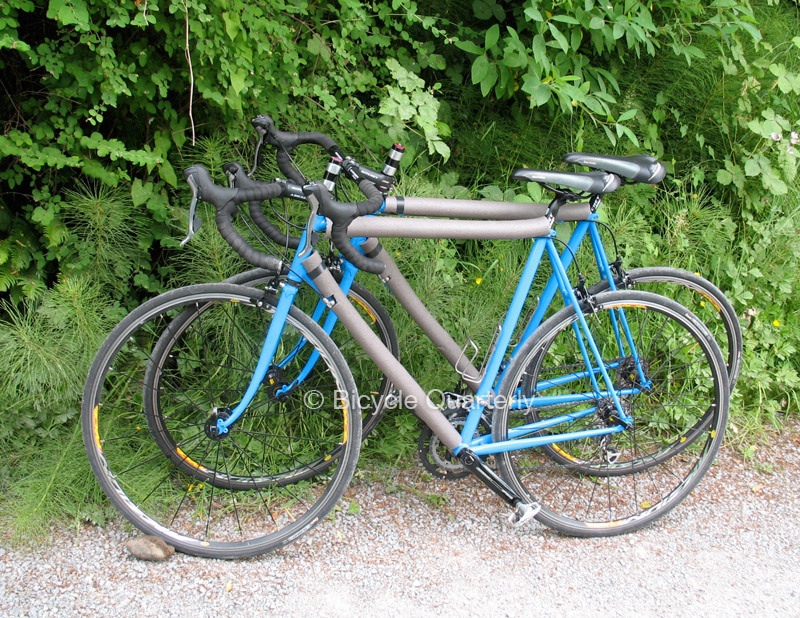 We did the double-blind test to make sure that our “subjective” on-the-road feel was in fact due to the frame tubing. If the frame tubing didn’t matter, then the bikes in the test should have felt the same. The fact that two out of three testers could pick out the “superlight” bikes with 100% accuracy over multiple tests indicates that the differences we feel are real. Our test included a third “subject”, who did not feel the very small differences between these frames. He thought he did, but when we unblinded the test, we found that his observations didn’t correlate with the frame’s tubing. The differences between the test frames were very small – all were flexible by today’s standards. If we had included a more overbuilt bike like most of today’s production steel bikes, it’s likely that even the third tester could have identified the different bikes. I’ll be very interested to read about how kinetic energy that is transferred from the rider into the frame by energizing a spring (the frame) is returned in a usable form to propel the bike. I’m not doubting the phenomenon of ‘planing’ as it pertains to making a bike ride faster and climb better, as I’ve experienced the phenomenon myself and I’ve already “drank the kool-aid”. But I have a hard time understanding how energy used to energize a lateral spring can be returned longitudinally in a kinetic form to affect forward acceleration. Even if the energy were to be returned in a usable form, there is an irrecoverable thermodynamic loss in the transformation from one form to another. But I don’t doubt that a scenario like this can happen on a bike. That research was done by Gary Houchin-Miller. He did a finite element analysis of a bicycle frame, and looked at the three flex patterns that occur. He found that when relaxed, each flex returned the energy to the drivetrain by pulling the chain forward. His research was published in Bicycle Quarterly Vol. 4, No. 4, as well as on his (now-defunct) web site. Any ideas about the tubing used in the Ritchey Swiss Cross? BQ reviews usually mention this, so I assume that info wasn’t available. I ride vintage 531 frames, 8-5-8 I think, and wonder if I would notice/like the difference in the ride of the Ritchey. We were under the impression that it was “proprietary”, but from the bike’s ride and performance, it must have been very thinwall oversize tubing. I will do pushups on the end of a diving board whilst someone from the “stiff” school of thought can do them on the concrete. Planing explained! Of course we care about efficiencies; everything about bike design if about it being as efficient as possible – rolling resistance, bearing drag, aero, stiffness etc all these are optimised so that we travel as far and as fast as possible for the energy input by the rider. I was talking about efficiency of calories burned per mile. If I go 10% faster and burn 10% more calories, you may say that I haven’t gained anything, but I am pretty happy with that result! However, even there, it’s more complex than just “more efficient = better”. Disc wheels are more efficient, but the bike handles terribly in crosswinds, so we don’t use them on the road. We could lower our handlebars by 2 inches and decrease our wind resistance by 10% or so, but we wouldn’t be comfortable, and our legs would hit our chest, reducing our power output, so we don’t do that, either. And higher tire pressures reduce the hysteretic losses inside the tire, making the tire more efficient, but they also increase the suspension losses, and thus the result is a wash.
What we really care about is going faster and further, and having more fun on our bikes! The concept of planing makes intuitive sense to me but the difficulty in isolating and quantifying it sure makes it hard to build it’s benefits into our bikes right now. Thanks for doing what you have to figure this out, there may be others working on it but they certainly aren’t getting the information out there as well. It’s going to be nice if in a few years we have a good working understanding of things and can design in the degree of planing we want with some certainty of achieving it. A bicycle is such a dynamic thing, surging and weaving it’s way down the road in such subtle ways, if we can dependably synchronize the “sine wave” of power inputs with the pattern of power returns through frame flex we’ll have moved the ball forward in a pretty exciting way. Thanks, Jon. In the end, bicycles always have evolved through trial-and-error. Build a frame, see how it works, and if it’s better than the previous one, retain its characteristics. I don’t see us changing that by a lot any time soon. For now, one can say that achieving a good balance of stiffness, as most classic steel bikes do, is a good idea. Some modern steel bikes, with super-oversize top tubes and skinny long chainstays, turn that balance on its head, and the result doesn’t seem to ride as well. Trial and error … a slow, expensive process when it comes to custom bike frames. Few people have the money and inclination to iterate. It is good you are challenging the accepted wisdom that stiffer is better. (I wonder if stiffer is better for carbon frames, given carbon’s damping characteristics.) If it is true a planing frame improves the rider’s biomechanics, it seems to me an easier way to get a similar result is with adjustable eccentric chainrings like Rotor Q-rings. Trial and error … a slow, expensive process when it comes to custom bike frames. I don’t think every rider has to do their own trial-and-error process. That is why we test things. Even if your pedaling style and weight is different from that of our testers, you can extrapolate and get better results than if you just blindly increase tubing diameters here and decrease them elsewhere. After all, classic racing bike frames evolved that way, and for racing, they are still among the best solutions. Most modern carbon bikes try to mimick the feel and flex characteristics of a good classic steel bike. Interesting to know where you got the notion of planing from, but regarding boats this statement is not correct. Have a look at this graph: http://s7e3a.scene7.com/is/image/boatinternational/graph-froude-resistance-curve-hull-yacht?$615×346$. (Froude number is basically speed, and resistance is proportional to fuel consumption per mile.) Energy consumption rises monotonically with speed. The purpose of planing is to reach high speeds, not reduce energy consumption. High speed conserves time, which is a type of efficiency but not what one is concerned with on a bike. It would be more accurate to say a bike that goes well is tuned to its rider’s biomechanics. Thanks for the graph about boat hulls. It’s interesting to see the plateau on the planing hull. So it doesn’t consume less energy, but you can go faster with very little extra energy input. That is sort of how I feel about bicycles that “plane” – so it’s more apt as an analogy than I thought. Although interesting I find the test biased. You can feel the flexibility of the frame you are riding ,no hiding here, and we know what your opinion is. Why not let a couple of local cat 1’s ride the bikes and measure. It would have made things more objective. Interestingly, the frames all felt the same – only their performance was different. If it the flexibility of a frame was easy to feel, then our third rider would have had no trouble identifying the bikes. Yet he was unable to identify the different frames, even though he thought he felt differences. At the time of the test, we didn’t have a clear opinion. Both testers just had received custom frames with stiffer frames, so 1) we were used to stiffer frames and 2) we had some investment in the performance of stiffer frames. If our “opinions” have changed based on the results of the test, then that is to be expected. Otherwise, we’d be pretty stubborn! What are your thoughts on the durability of these super light tube sets on your bikes? Your conclusions seem to all but suggest the thinner the better, but a tall and heavy rider such as myself obviously should not use ultralight tubing. Based on the original BQ article, I wanted to try a much more flexible frame. I had my previous steel frame for comparison, so I cut it up to measure the tube walls, and used engineering calculations to compare relative stiffness of different tubes. It seems that builders are more likely to compare notes than to use engineering formulas to arrive at a tubing selection, so the results are not consistent between customers. So far, so good. We have a good number of superlight steel frames in use now, and no problems, as long as they are built well. Mine has about 18,500 km, many on rough roads… There also are many bikes with the same wall thicknesses, but oversize tubing, from many different builders, and those seem to last well, too. We don’t know yet whether they’ll last for decades, like frames with thicker-wall tubes. On the other hand, I am willing to take the risk. If my bike gives me much more fun, but lasts only 10 years instead of 20, that is a hypothetical trade-off I am willing to make, even though I don’t think that it will turn out that way. The stresses on a bike’s frame are concentrated near the joints, and by having tubes with very flexible center sections, you remove some of the stresses there. It’s like the airplanes that have flexible wings so they don’t snap off at the fuselage. Speaking for the evidence-hungry cyclists out there: would you show the full results, and not just for one rider? Or show the results of a combined analysis. Regarding the graph for a single rider: even if one omits the 5th run which contradicts your theory (lowest power on the presumably better bike), there are only so many ways to order 4 runs on 2 bikes, one stiff (S), the other flexible (F), from highest to lowest power: FFSS, FSFS, FSSF, SSFF, SFSF, SFFS. So there is one chance in 3 that one bike will be “consistently” better than the other. Since you used several testers (say 3) to compare 4 bikes (so 6 pairwise comparisons), you have 18 sets of results. The expectation is that 3 of these results would show that the flexible bike is consistently better even if the frame had no bearing on produced power. would you show the full results, and not just for one rider? The runs were done consecutively, with little rest. So you expect the first run to be fastest, and the last to be slowest. It wouldn’t make sense to re-order them. The 5th run only shows the the rider is exhausted. This post sure has generated a lot of discussion here in our shop(not a bike shop but full of Riders and Racers anyway). One thing that keeps popping up in our conversations (and I think another commenter here raised it as well) is about Carbon Fiber Composite’s supposed superior damping characteristics. I’m not an engineer but I’ve been around this stuff my whole life and have been building things for most of it, and my understanding is that for damping to take place in any context there has to be flex somewhere. I don’t understand how a material like carbon fiber can provide stiffness AND damping to any remarkable degree. Is there something going on with modern composites that contradicts that? In the world of Experimental aircraft and sportscar racing this material does not enjoy a reputation for exceptional damping when configured for stiffness. I’m not the person to answer this question but this subject sometimes has some of the distinctive odor of marketing jiggery-pokery. Carbon frames flex, too, especially the lightweight ones. I read somewhere that Lance Armstrong once rejected a prototype Trek because it was too stiff for him. Carbon does dampen shock better than steel, but damping isn’t a problem on a road bike. Even the extra-flexible fork blades we use on our bikes don’t pogo like those old American cars with soft springs and under-dimensioned dampers. The amount of flex is too little to require any damping. Some riders confuse damping with shock absorption. However, carbon parts cannot flex very much before they delaminate, so carbon parts usually are designed to be very stiff. You can flex steel a lot with no harm, so you can design very flexible parts out of steel (or titanium). That is why a well-designed steel fork can absorb much more shock than a carbon fork. I appreciate what you’re trying to measure, but in most of your tests of this nature (this test, the lynskey v. randonneur or whatever it was) I cannot get past the subjectivity of the effort. Namely, you are assuming that the efforts are identical and/or do not vary. I understand your analysis of the consistency of the drop from bike 1 to bike 2 as a way to minimize this, but I’m not convinced given the incredible number of other variables that occur as we all ride our bikes. I would think with the increased technology in power meters, analyzing effort on a bike with pedal, crank, and rear hub power meters would give you a better idea of exactly what was going on. Your concern is totally valid. We did the double-blind test exactly for that reason: It removes as much of the subjectivity from the testing as possible. Neither the riders nor the test administrator know who is riding which bike. And all other factors are the same. We rode the bikes side-by-side, so weather and even fatigue of the riders are the same. That test showed us that our on-the-road impressions hold up to the highest scrutiny. We cannot do double-blind testing for every bike we ride, but we now are confident that what we feel “subjectively” on the road holds up even if we don’t know which bike we are riding. Furthermore, “perceived exertion” has been shown to be a very good, objective measurement. It’s not as quantitative, but it’s highly replicable. So “sprinting as fast as he could” is actually more objective than it may appear at first. I would think with the increased technology in power meters, analyzing effort on a bike with pedal, crank, and rear hub power meters would give you a better idea of exactly what was going on. We will continue to use power meters, but they can only tell us so much. Equipping the Lynskey, Seven and randonneur bikes in the “Ti Shootout” with power meters wouldn’t tell us much. The power output on the (heavier) randonneur bike clearly was higher, otherwise, it wouldn’t have kept up with the (lighter) Lynskey. I don’t recall reading about heart rate in any of the tests. Was heart rate measured, or are you inferring your HR must be higher since you’re putting out more power? I hadn’t thought about it that way before, but it seems like a simple test for the readers at home: on Bike A I can consistently get my HR up to 185, but on Bike B I always max out at 180, therefore Bike A planes better for me. My HRM-wearing friends are always bugging me about getting one; maybe I’ll try this and see if there’s a difference between my bikes. I don’t have a well-matched riding buddy, so I don’t have anything beyond “I like how this bike feels” to judge performance. Maybe that’s all that matters? Your test probably would work. An even better test is just doing hill intervals with two bikes, changing bikes after each interval. Then plot the times, and see whether they are consistently getting slower, because you are fatiguing, or whether one bike works better than the other. Couple that with how you feel on the hill (“easy to put out power”, “bogged down and hard to get going again”), and you’ll know which bike works better for you. The most important test always is “I like how this bike feels” – that is why we ride, after all! I think planing is more appropriately related to jumping on a trampoline. Timing is everything. Get in sync with the trampoline and you can fly ; Jump at the wrong time and all the strength in the world won’t get you going . Also, a heaver person will jump at a slower pace than someone lighter. Does this mean that two physically different riders will plane at different cadences on the same bike? Probably. I find that my cadence varies depending on the bike I am riding. On bikes with oversize tubing, my cadence has to slow down to get the best out of them. Sometimes, it takes me a few days of riding to adapt to this new style, and only then does the bike feel “right”. So the rider is a crucial part of the picture. Factor in different frame sizes and different power outputs, and you see why we say “performed well for our testers” rather than talk about absolutes. Wouldn’t this also mean that the blinding was inadequate? Blinding just means that nobody present knows which bike is being ridden. It’s standard practice – most commonly used when testing medications. Just because the patients get better after taking the medication (rather than the placebo) doesn’t mean the study wasn’t blind. After thinking about your question some more, perhaps I understand it better now. Wouldn’t the test have been more blind if the riders never felt any difference, and only the stopwatch/power meter showed the difference between frames? It’s a moot point, since that is not how planing works. Planing is a biomechanical interaction between rider and bike. And that is a good thing, because more than the stopwatch, we care about how the bike feels and how much fun it is to ride. Ok I had to read the post again. You wanted to see if riders could feel the difference in the bikes that is why you made them all look the same. And you found that yes riders can feel the difference. The blinding for this part of the test seems solid. My question is about the second part…the difference in performance. Could knowing which bike they rode, which you found that they did, effect their performance? Well, they could tell the bikes apart because one performed better, so I don’t think it was a case of “Ah, I like how this bike feels when I lean into corners, and thus I’ll pedal harder on it.” Really, the bikes were indistinguishable, except in how they responded to our pedal strokes. Beyond that, none of us like getting dropped. When we race each other up the hill, our main goal is to get ahead. Our second rider (who was slightly stronger that day) also preferred Bike 2, but he was able to put out the same amount of power on both bikes. It was just much harder for him to do so on Bike 1. Part of the reason his power output on Bike 2 wasn’t greater may have been the fact that the other rider was on Bike 1, and thus slower, so there was no “need” to unlock that last bit of performance. When this rider was on Bike 1, he had to match the other rider’s higher power output, since that rider now was on Bike 2. However you slice it, it was pretty clear that Bike 2 performed better for both riders. When I ride my bike 1, I feel like it carries more momentum, and feels easier to move the pedals and get them up to a fast spin than my other bike 2. When on flats and down hills, the bike 1 seems to respond quickly to pedal strokes by throwing itself forward with momentum when I am trying to accelerate. This sensation is more apparent and obvious feeling to me when I am at peak fitness of cycling season. So maybe having the ability to apply more power to the pedals is what we feel rather than frame flexing. Also, I don’t know if I can trust my subjective feelings, because I do have bad days where I just feel like I’m pedaling through wet concrete. 2. Is there any observable proof at this point, not just subjective experiences (though they are helpful), that a frame can receive, store, and then return power in the way described by planing? Same goes for the stiffer is better idea. Is there any observable proof of that? I’m talking to actually see these phenomena happen in the frame material. To be able to see the effects of power applied , and the behavior of the frame materials as they occur in cycling? To my knowledge, nobody ever has measured the efficiency of frames. The “stiffer is better” camp has never shown that energy is somehow lost in frame flex. However, the finite element analysis is pretty clear: Energy is stored, it is returned to the drivetrain, and very little (<0.1%) is lost due to hysteresis and converted to heat. Until somebody proves the contrary, I am willing to accept that, especially since it matches our observations. 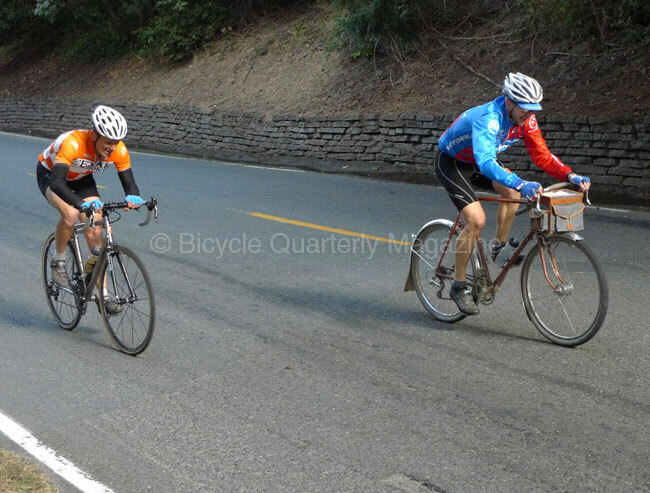 Climbing speed isn’t subjective – one bike objectively was faster, consistently. We did a statistical analysis, and it wasn’t pure chance, or something else. Interestingly, the bikes felt the same in every way, except one climbed better. So it wasn’t that we started riding, and one bike felt “squirrely”, and we knew which bike we were riding. It was more like: “Yes, this bike goes faster. It responds better to my pedal strokes.” Then we marked that bike as “fastest” for the day. (Each day, the bikes were identified with different colors of stem caps. The caps were switched from one day to the next.) When we unblinded the test, we found that two of three testers consistently had marked the two “superlight” bikes as the fastest ones, and the “standard” bike as the slower one. Before I ask a question, here’s some historical perspective on frame flex, a hot topic in the French cyclotouring magazines from the 1930s on. With tubes getting lighter, the tendency of frames to warp under pedaling action was considered a problem. Many solutions were provided to keep a ridden frame stiff in the lateral plane. Albert Six came up with extra tubes from headtube to dropouts, and Etienne Bernadet introduced seat stays crossing the seat tube. While lateral flex was considered bad, a certain amount of vertical flex was desired. It was known to absorb road shock and to prevent fatigue as a result. I have experienced the “planing” phenomenon on my Routens, which has tubes that noticeably flex in the vertical plane, especially with camping luggage. The frame also has several reinforcements for lateral stiffness. I appreciate their intended functions, I guess they help to keep the rear wheel in plane and the drivetrain more efficient. Even before I consulted the old literature, I always assumed that vertical flex is the essential factor in the mix that causes “planing”. My question – do you think lateral flex is of any importance there? The finite element analyses indicate that both vertical and horizontal flex can be beneficial. However, because a frame is triangulated in the vertical plane, most flex will occur in the horizontal plane. “Laterally stiff, but vertically compliant” is a) difficult to achieve and b) not desirable. Everybody knows these “drainpipe” frames don’t perform well, so the builders all over the world came up with a crutch: They believed that high-end tubing, like Reynolds 531, was stiffer than the lesser grades. This isn’t true (all steels have roughly the same stiffness), but it helped them explain why the more flexible frames from lighterweight tubing performed better. In the end, it didn’t matter. Builders made frames that performed well. The builders thought these frames were stiffer than lesser frames. That they were in fact more flexible wasn’t a problem, since all the riders cared about is that they performed better. Great test, write up, and discussion. Jan and the staff at BQ continues to impress. In a perfect world, frame manufacturers would include the tubing data in the frame specs so buyers could make a more informed choice. And in a perfect world, all of us would be able to afford a custom frame. I know BQ has tested over 60 bikes and I am wondering if you could highlight any standout production frames that approach (I realize they won’t equal…) the planing of the Jeff Lyon frames you guys tested. The Winter issue (now in the mail) has a review of 11 of our favorite test bikes… As to production bikes, I think it’s difficult to work with the super-thinwall tubing in a production setting, so most makers opt for somewhat more conservative tubing choices. Very interesting reading. I will look at the full write up to get the complete picture, but I have one question straight away. Is the flexing mostly/entirely in the main triangle? Does the rear triangle or the front fork play any role in planing? It caught my eye that you only mentioned the wall thicknesses of the main triangle tubes. I’m also interested in any insight I can glean for optimizing a frame for shorter crankarms, as in whether planing might be enhanced by making the tubes a bit lighter still because of the lessened torque at the bottom bracket from using, say, 145 mm crankarms. When I say optimized, I mean with the BB a bit lower to enhance stability while maintaining typical pedal clearance at the bottom of the stroke, and which will also lengthen the seat and down tubes a bit. Of course, the longer tubes might also enhance flexing. We only varied the main triangle, because we wanted to change only one variable. Chainstays seem to play a different role – many of the best-performing bikes use relatively heavy-gauge chainstays. Shorter cranks should reduce the flex, since there is less leverage and you are likely to spin faster. However, most cranks available today vary in length only by a few percent, not enough to be a concern. The 145 mm cranks you mention are a different matter, but I don’t know anybody who offers (or uses) cranks that short. I know there has been some research suggesting that cranks that short have advantages, though. Heavy gauge chainstays make sense. Most of the forces should be nearly parallel to the chainline, so intuitively I’d imagine flexing in the stays would not enhance flexing gains, and might actually be a negative. I too have seen some research on short cranks, and I’ve been using 145s for two years. They do seem better for quick, light spinning (conventional fitting would have me using about 170 mm or so). Bikesmith designs in Minneapolis specializes in reworking cranksets to shorter lengths. He says his clientele are mostly time trialists, since shorter crankarms offer definite advantages for aero positions; riders can get flatter, because they have better clearance for their knees, and can engage their glutes more in pedaling. I have a simple experiment to test whether BQ testers experienced material cognitive bias in the comparison of the rando and the modern titanium bikes: ask the folks at Seven Cycles to do the same test you did with a Seven Axiom and a 24 pound steel rando bike with fenders, lights and a rando bag. If the results are the same, then I would be more convinced. There would seem to be little doubt that you guys are biased given that promotion of rando bikes is not only your passion but your livelihood. Not a criticism, just an observation, if you are going to rely on the scientific method to support your promotion of all things rando. That is a valid concern… Seven certainly is welcome to repeat our test. We’ll even lend them a bike. I think Bicycle Quarterly has developed a reputation for honesty, in part because we often don’t find the products we sell to be flawless or optimal. Our main business is publishing Bicycle Quarterly, and it would be foolish to jeopardize our reputation, just to sell a few extra components. We really expected the story to be “Yes, the randonneur bike is a bit slower, but more comfortable/versatile/whatever.” Our first run up the hill seemed to bear this out – the titanium bike was faster. 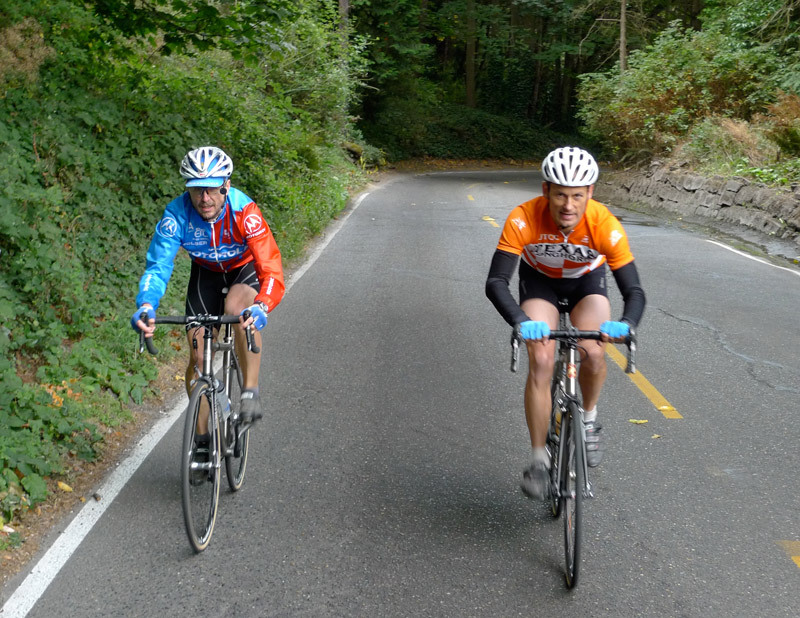 However, when we switched bikes, we realized that Mark simply was faster that day, no matter which bike he rode. The gap always was the same, so we concluded both bikes offered the same performance for us. It would be a pretty elaborate scheme to try and ride up the hill with just the right distance between riders while still putting out 500+ Watts… Furthermore, in the double-blind test, we had no commercial interest at stake. We don’t sell frame tubing. If anything, you’d expect us to like the bike most similar to our own to perform best. Each test also had an independent observer, just to make sure we don’t get accused of simply fabricating the data. So I think the main conclusion, that some frames allow the rider to put out more power than others, is beyond any concern of commercial interest. In the end, we all know that a racing bike, made with the frame of the randonneur bike, would be faster: same flex characteristics, less weight. How much faster is a different question, and perhaps one we’ll test in the future. I am not suggesting an intentional “scheme” to cook results. I assume you all made a good faith effort to be fair. A cognitive bias is unconscious. The theory is that when Mark lines up with the rando bike he is more excited or passionate and tries harder than when he lines up with the titanium bike (because he loves rando bikes). That is the primary cause of the greater power, and not the thickness of the tubing or geometry. If the theory is correct, titanium lovers would generate more power with titanium bikes. And to be clear, there was nothing blind about your titanium vs. rando test, making the potential for cognitive bias much greater. I understand the potential for unintentional bias. If that was the case, the second bike in our titanium test would have performed better than the Lynskey. We both didn’t find the Lynskey very appealing. We both liked the Seven better aesthetically, it had better tire clearances, and on the road, the two felt indistinguishable. Until we put them through the back-to-back test. The difference was small, but it was there every time we raced up the hill. Long-time readers also will remember that the “superthinwall tubing craze” was started by a bike we didn’t like initially. We put the Terraferma against my Alex Singer, a bike that I had ridden for years and on which I had done my best-ever PBP. My beloved Singer was upstaged by a racing bike with golden lugs! If there was any subconscious bias, it would have gone toward the Singer. What we’ve concluded is that our desire not to get dropped overrides any preconceived notions about the bike. Based on the Terraferma test, we designed the double-blind test to make sure these on-the-road “impressions” held up to scientific scrutiny. They do, and we now don’t feel the need to re-prove this every time we test bikes. I have no doubt that Jan et al have every intention of applying the scientific method and satisfying the scrutiny of their peers. Both Jan and I have advanced degrees in a scientific field. I don’t know about Jan, but I’ve published many peer reviewed papers in respected scientific journals. This is where peer review makes the difference– if I ever attempted to publish a study using the same test methods that Jan et al used to determine climbing speeds in a “blind” study of three different frames, it would be flat out rejected because the study subjects (not the frames, but the people) were not chosen from a large enough cohort. The fact that Jan and his buddies were the subjects would be completely inappropriate in ANY scientific study. Secondly, questions of conflict of interest would certainly be raised. But since BQ is not a peer-reviewed journal, Jan is free to publish what he wants and assert his conclusions and interpretations with the backing of an air of scientific rigor, citing his scientific background. But at the end of the day, it’s not peer-reviewed science, and that’s the big difference. I have no doubt that Jan is an excellent scientist. But his lack of a peer-review process kills his science. I would really like to see Jan recruit study subjects from a diverse yet relevant pool (experienced cyclists who come from different backgrounds and who have diverse preferences with regards to cycling and bikes), in the same way that a clinical study has to choose study patients who fit diverse yet relevant criteria for the study to make the study meaningful. Until then, I will always have to filter Jan’s conclusions as affirmations of his personal beliefs. Just like you, I have published extensively in peer-reviewed journals in my previous career as a geologist. BQ contributor Mark Vande Kamp still works as a scientist designing exactly these kinds of studies. He frequently publishes in peer-reviewed journals. Many people assume that Bicycle Quarterly‘s articles are not peer-reviewed. This is incorrect: All our important test articles are peer-reviewed. This is unique among cycling publications. The double-blind test was reviewed by Jim Papadopoulos and Hank Folsom. Jim is probably the most scientific of bicycle researchers, having published in Science and other prestigious journals. Hank has more experience with frame tubing than almost anybody. You concern about the study cohort is an interesting one. You misunderstand the hypothesis. If our hypothesis was that “planing” was a factor that influenced bicycle performance for average riders, then our study would have been flawed. However, that was not our hypothesis. Our hypothesis was that the sensations of accessibility of a bike’s performance that Bicycle Quarterly‘s testers feel on the road are real and intrinsic to the frame. Basically, we wanted to know how reliable our observations were. We found that they held up in a double-blind test. We could reliably detect very small differences in frame tubing. Of course, you cannot conclude from this that “planing” works for everybody. In fact, we included a third rider in the tests, who thought he could detect differences, but whose observations were random. So we already know that for relatively small differences in frame tubing, there are some experienced riders who don’t feel the difference. We thought about expanding the study with more subjects, but concluded that it would not tell us anything new. The number of study subjects would have to be large to get statistically significant results. We’d need 100+ study subjects, and all we’d show is that some people experience a difference in performance and feel on these bikes and others don’t. It might be interesting to compare more dissimilar frames – say a Surly Long-Haul Trucker with a superlight frame (with the weight equalized), but I am afraid that running tests with hundreds of subjects is beyond our budget. And in the end, the readers still would be left wondering whether they belong to the group for whom “planing” matters or to the group for whom it doesn’t. In summary, we showed that “planing” exists, not how prevalent it is. Jan, I have no doubts that you, and your selected peers, are rigorous scientists. My point is that the studies you present in BQ along with the conclusions made, would never stand up to true peer-review. You claim that you use a peer-review process, but you are hand-selecting your reviewers. A peer-review journal’s editor would pick anonymous peers in the field to do the reviewing, and even though many researchers ask the editors to pick certain people to review (or exclude certain people such as competitors), that rarely happens and most editors pick the reviewers that they feel are the most qualified to provide critique. As for sample size, your subject pool of three included one anomaly. There is no way of knowing whether that anomaly was a random outlier or a statistically significant data point given your small sample size. However, I disagree you would need 100+ subjects. Medical studies of rare diseases are often done with limited subject pools, but never with as little as three. I think if you got 10-15 random cyclists, vetted for having experience in some type of professional cycling, but otherwise having no association with BQ (including personal relationships/friendships), your study would have the potential to be more conclusive and significant. You claim that you use a peer-review process, but you are hand-selecting your reviewers. That is a pretty serious accusation. If you can think of better reviewers for that or other articles, please let me know. Jim Papadopoulos was selected because he had great doubts about planing, or even that frame stiffness mattered at all. You can read his writings, and you will see that he was not at all a reviewer who was favorable to the hypothesis we were trying to prove. Also, can you show me any other bicycle-related research that has underdone a review process that is as rigorous? As for sample size, your subject pool of three included one anomaly. There is no way of knowing whether that anomaly was a random outlier or a statistically significant data point given your small sample size. Again, you confuse the hypothesis that we were trying to prove. If you are trying to prove that the Higg’s Boson exist, you only need to find one, not 10 or 100. To show that “planing” exists, we only needed one study subject. We used several because it facilitated our test and made it easier to obtain statistical significance. Your background is in medical research, and there, it works differently, because people get healthy randomly. If you showed that a medication cured Ebola in one subject, you wouldn’t have proven anything. But imagine if you could quickly reinfect the subject, then cure him/her again. Repeat a dozen times. Then reinfect them a dozen times, and don’t treat them. If they die each of those times, then you would have shown that at least for one subject, the medication cures Ebola. Of course, you cannot do this, so you have to do a study with multiple subjects, which has the added advantage of giving you an idea whether the medication works for many people, or just very few. But this doesn’t mean that the Higg’s Boson doesn’t exist because it’s been shown only a few times. With all due respect, what’s the serious accusation? That you hand-picked your reviewers? But you admit that you did! My point is that the difference between your studies and conclusions presented in BQ and the science published in scientific journals is the nature of the peer review process employed. I commend you for the passion you have and the drive to understand bicycle/rider dynamics and I will continue to read BQ for the insights it provides, but I do feel it’s important to distinguish BQ’s studies from those reported in genuine peer-reviewed journals, simply for this difference. I understand that there are few professionals in bicycle dynamics research who wouldn’t already be associated with large bicycle manufacturing firms (and therefore not a good source for peer review), so you do what you have to do on a limited budget and communicate your work through your magazine. I get that, and appreciate the work you put into your studies and BQ– I support it, after all; but you can’t blame people, especially those with scientific backgrounds, from questioning your study design and peer review process. Skepticism in science is good. I agree about the differences in basic research and medical research. FWIW, my background is not in clinical research, but basic laboratory research, where the goal was to design and execute experiments to test concepts, not the effects of drugs on people, then analyze the data, interpret the data and generate conclusions. No different, really, from the research you’re doing in bicycle dynamics. Feel free to continue the conversation privately–if you wish–as I suspect you consider this discussion to have veered way off scope. I wonder if a bike being faster at a short time 500+ Watt all out effort is necessarily the faster bike when riding for several hours at medium or lower power output. This seems to be the implied assumption in BQ discussions. The forces (whence flex) being applied to the bike vary quite a bit. You raise a very good point. We found that the higher the power output, the stiffer the frame should be. In our double-blind test, the stiffer frame performed well when the rider had a good day and was going all-out. Under a more moderate power output, the (subjective) difference between Bike 1 and Bike 2 became even greater. However, this would be difficult to quantify. Over a five-hour ride, there are too many variables that could influence the test results. Having ridden the equivalent of Bike 1 and Bike 2 in 1200 km brevets, I know I prefer Bike 2 over the long distance. Whereas for me, in a sprint when I am in top shape, there isn’t much between the two bikes. The interaction between man and machine can hardly be reduced to a simple linear spring model- aren’t both three dimensional nonlinear dynamic systems requiring more complex models. Thin tubed frames may sync up with some rider’s pedal strokes; however, combining light steel frames with a low trail front end (sans handlebar bag on a decaler) pushes the system towards a critical point aka shimmy. How to optimize. What are the tradeoffs. Jan’s empirical evidence is compelling. Golf shafts might be a better comparison than a boat going up on plane to describe how some frames perform for some riders and not for others. Put the wrong shaft into a players hands and the launch angle, direction, and most significantly distance will suffer. The player puts out the same “power” but the ball just does not go as far. Where the shaft flexes, how much it flexes and the material used in the shaft matter greatly. This type of dynamic fitting was laughed at in golf 30 years ago. We might see more complex fitting for bike frames in the years to come although I am skeptical given the costs. 15% better climbing? Where do I send the blank check? The answer to the last question (August 17 is the start of PBP) is easy to answer: Compass Babyshoe Pass Extralights. The other questions are more complex, but I totally agree that comfort in all its various guises is crucial for good performance on long rides. That is why I ride 42 mm-wide tires on paved roads. Planing plays into that – if you legs hurt during hard efforts, that also adds to the discomfort. Two curves that I think help explain part of the phenomenon. That is essentially the same idea that I had when thinking about the positive effect of frame flex in relation to the pedaling force. An ideal pedalist with constant force on either pedal would not see the frame flex. Response to surface roughness is a different point. The text associated with the curves can be seen by clicking the photo. I find this topic to be very interesting but I come at it from a different perspective, weighing 400 lbs. I’ve been riding a 1983 mountain bike that at best probably has cro-moly main tubes. I’ve been riding it with 26″ x 2.15 Big Apple tires. It’s a blast. I feel great and my pedal strokes and cadence just seem to work and I enjoy the ride. I had a mechanical issue the other day so I got back on my “good” bike, which is a Handsome Cycles Devil. I don’t know the tubing specs but I suspect it’s not as stout as the old MTB. The overall bike is certainly several pounds lighter than the MTB. I am running 700 wheels with 32mm Vittoria Hypers, which are considered to be one of the better performing touring tires. Riding the Devil, my cadence and the “feel” of pedaling just felt “off”. On the MTB I cruise along at 55 gear inches and on level ground I’m steady at 12-12.5 mph. I put the Devil in the same gear and I had a very difficult time getting and staying at the 12mph range. My heart was pounding in my chest and I felt like I was working twice as hard as I do on the old MTB. It was overall, just a horrible feeling ride. Might I be experiencing the opposite effect where the Devil is simply too flexible for my 400lb weight and I’m actually losing energy? That certainly is a possibility. We found when we tested a road bike with an elastomer for rear suspension that the right amount of flex greatly improved its performance. Too little, and it felt just like another stiff aluminum bike. However, too much flex also didn’t feel good. The bike wasn’t even “pogo-ing” yet, but it felt like it wasn’t going anywhere. Given Chris’ weight, the Vittorias on his Devil are overloaded. I estimate the tires would need to be inflated to ~100/150 psi front/rear to have 15% compression. If I have looked up the right tires they are rated for 70 psi maximum. It’s no wonder the bike is slow given how much the tires must be deforming. The Big Apples on his mountain bike are well within their load capability. That is a perfect description of how it felt. The degree to which frame stiffness affects propulsion (for better or worse) would have to be a function of a number of things including rider strength, mass and cadence. Differing frame frequency responses (which would be different for different tubing diameters, wall, frame size and fundamental design) and differences in exactly how one rider pedals vs. others (reflected in nuanced differences in the pedal force vs. crank position curves) would also have to be relevant. It isn’t difficult to imagine a frame that’s so flexible as to make a bike feel (and truly be) slower than others. Any roll down test results coming for the new Compass tire line soon? Particularly vs. the most recent versions of the Grand Bois tire line? We can’t do roll-down tests any longer, since our test track has been destroyed. The city built a skateboard park on part of it. We haven’t found another one yet that is suitable. (It needs to have a steep incline at first, then a gradual rollout, plus no traffic.) However, we do plan to test tires on the track with a power meter soon. We just need to figure out the logistics, plus get some wind-free, not-too-cold weather. (Tires roll slower in colder weather, and while we have a formula to compensate for that, the less we compensate, the smaller the error.) All these conditions usually align in the spring. Mostly, we want to test tubeless vs. tires with inner tubes, tires wider than 32 mm, and a few other variables.